Contractors, suppliers and joint ventures play an important role in our activities around the world. The construction of major projects employs a large number of workers. In 2013, around 200,000 contractors worked for Shell. Large projects provide opportunities to build local economies through employment, skills development and training. The increased demand for goods and services can also help to create and grow local businesses. This can have a positive impact on communities. However, increased activity can put pressure on local infrastructure. This may include more traffic, more use of local services and higher living costs. We identify the potential impacts and put measures in place to reduce them. 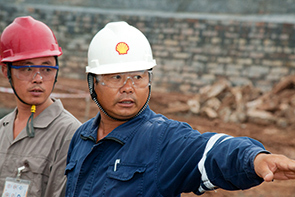 Shell purchases large volumes of goods and services from suppliers. In 2013, we spent around $65 billion on goods and services around the world. Our Supplier Principles set out a mandatory set of requirements for all suppliers and contractors. We assess suppliers who want to do business with Shell based on the level of potential risk, especially in the areas of anti-bribery and corruption, human rights including labour rights, safety and the environment. In 2013, we conducted 577 assessments of our suppliers and contractors on their level of compliance with our principles (see “Social performance”). We purchase products and services that support our approach to sustainability. For example, we work with suppliers that can build pipelines using non-metallic materials, where appropriate, instead of carbon steel. Non-metallic pipes have a smaller carbon footprint than carbon steel pipes. Transportation and installation are also easier as non-metallic pipes weigh around a quarter less than the equivalent size steel pipe. Shell Shipping also uses a supplier that provides low-friction paint for ship hulls, which makes the ship more fuel efficient. When we operate a joint venture we apply Shell standards that cover health, safety, security, environment and social performance. The Shell General Business Principles and the Code of Conduct also apply to these joint ventures. We work with partners to share safety standards and knowledge across the industry. For example, the Netherlands has a national oil and gas industry programme, called HSELife UNIO. This programme aims to embed common safety practices across Dutch oil and gas companies, where different standards exist among various operating companies. The development of the standards is based on the work of Nederlandse Aardolie Maatschappij (NAM, Shell interest 50%), Centrica Energy and the WAT Group. In 2013, nearly all Dutch oil and gas production companies joined this initiative, which is also supported by the Dutch government.